↑ "laser". Reference.com. Retrieved May 15, 2008. Taylor, Nick (2000). LASER: The inventor, the Nobel laureate, and the thirty-year patent war. New York: Simon & Schuster. ISBN 0-684-83515-0. Northrop Grumman's Press Release on the Firestrike 15kw tactical laser product. 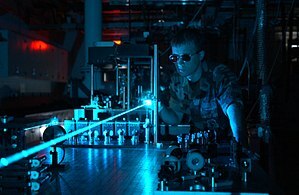 Video Demonstrations in Lasers and Optics Produced by the Massachusetts Institute of Technology (MIT). Real-time effects are demonstrated in a way that would be difficult to see in a classroom setting.